Home » Healthy Recipes » Lunches » Vegetable frittata by Angela Berrill. 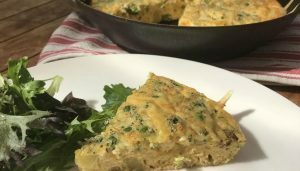 Frittata’s are a nutritious and simple way to concoct a family meal using leftover vegetables. Here Dietitian Angela Berrill shares her favourite recipe that also featured on her Mate with a Plate interview with Wendyl Nissen on Radio Live 10 September 2018. Herbs and seasoning to taste. My boys are a bit fussy when it comes to herbs and spices so I tend to only use a pinch of pepper when making this recipe for them. However, you could add 2tbsp of your favourite fresh herbs, roughly chopped. 2. Whisk eggs and milk together in a large bowl, until combined. 3. Stir in the vegetables, cheese and any seasoning. 4. Heat the olive oil in a medium-sized pan, over medium heat. 5. Pour the egg and vegetable mixture into heated, oiled pan. 6. Heat over medium – low heat, until the frittata is cooked through. You can tell if it’s cooked because the sides will start to pull away slightly from the side of the pan. The egg will still be a little runny on top. 7. Remove from the heat and place the pan under the hot grill, until the top is cooked through and golden. Keep a close eye on it though, so it doesn’t burn. 8. Remove from the oven (watch the pan’s handle, it might be hot) and allow to cool. 9.Serve with a side salad and your favourite relish. 10. Any leftover frittata can be used for school lunches the next day.